In the last week several members of the Social Connections team attended Engage conference in Ghent, Belgium. It was a great event and I recommend everybody to visit it next year. Many of us love the way Theo Heselmans runs this event and Engage always provides us with inspiration on how to improve our own conferences. By the way, Engage is sponsoring our event in Boston and we greatly value their support. The reason for this post is that members of our team received a lot of questions in Ghent regarding the future of Social Connections after Stuart’s recent career move. Though this user group is his baby and his involvement is now somewhat reduced (he won’t be in Boston, for example), we want to make clear that Stuart is still with the Social Connections team, and we continue to plan future activities and events. The event in Boston is definitely NOT the finale! We are already planning and working on the Social Connections 9 event in Western Europe this autumn. As usual, we will announce the exact date and location during our closing session in Boston. The group remains IBM-centric and focused on IBM Connections and related topics, as it always has been. On the other hand, we want to widen our scope to include more speakers from ‘outside the bubble’, presenting on generic topics like collaboration strategy, social business adoption, digital transformation, the future of work, and so on. Again, there is no big change, the talks on these topics started many events ago. 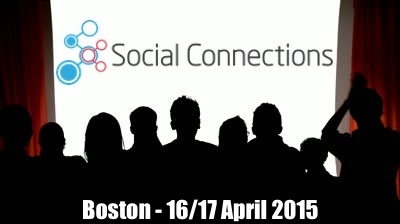 The world of social collaboration continues to evolve and the team are delighted that Social Connections has became a significant event in the conference calendar (the only semi-annual multi-continental user group we’re aware of!). Whilst the Boston event is somewhat limited by the venue’s capacity, it has still seen new peaks reached for numbers of sponsors, sessions, speakers and even IBM Champions in attendance. In addition, it has seen even closer collaboration with IBM itself, with previously unimaginable access to product managers, designers and development lab staff. The team are happy to continue to share in discussions about the future direction of this user group – we greatly value the input of our long-term sponsors and speakers, and of course we try to listen to all members of this great community. However, the team are also very confident that our own strategy and direction means that the future of the Social Connections user group is both bright and assured! We can’t wait to see you in Boston!